When a trader starts his currency trading journey, he/she generally choose EUR/USD. But Why ??? The answer is simple. EUR/USD can be traded at lower spread, EUR/USD has two biggest economy in the world, and EUR/USD is traded at larger volume. But, the straight forward answer is that the EUR/USD is a major currency pair. In forex market, seven major currency pairs are available. 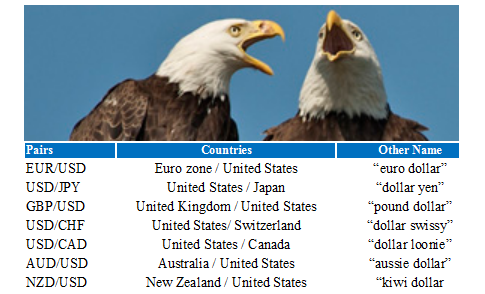 In the image below, the seven major currency pairs are listed. From the above listed major currency pairs, we can see all major currency pairs have USD either as a base currency or a counter currency. This is one of the reasons why USD is the king in the forex market. In the image below, the involvement of USD in forex transactions is illustrated. 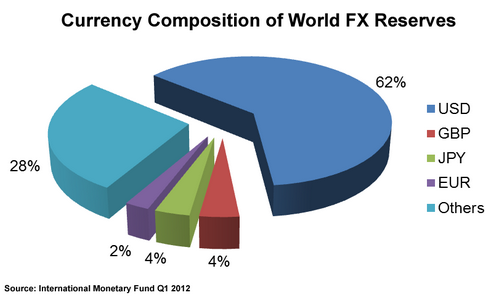 According to the International Monetary Fund, USD comprises 62% of the world’s official foreign exchange reserves !!!!! United States economy is one of top three largest economy in the world !!!!! According to wikipedia.com,United states economy is the biggest national economy in the world. It represents 22.4% of nominal global GDP and 16.6% of global GDP (PPP). The United States' GDP was estimated to be $17.555 trillion as of Q3 2014. United states has a stable political system. United states has largest and most liquid financial markets in the world. USD is the widely accepted currency as the means of transaction across the borders. Though Chinese Economy may beat the United States Economy in recent years, but it is not very easy for CNY to beat USD in forex market. 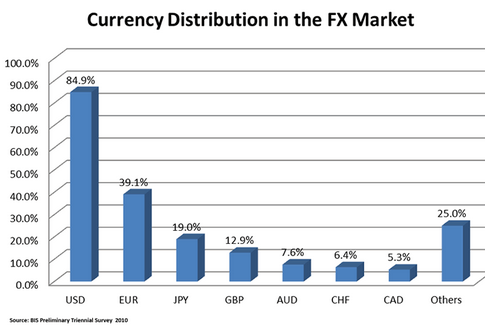 Dear Friends, hope you have enjoyed my post "Why USD is the king in forex market". If you have any questions, suggestions, or complements, you can drop a comment below.